Jim grew up in northern Michigan near Sleeping Bear Dunes. He is a freelance writer and the author of three books, including The Wild Upriver and Other Stories(Arbutus Press, 2005) and Martha Maxwell: Natural History Pioneer (Filter Press, 2005). 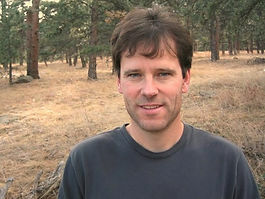 His most recent book, The Way Home: Essays on the Outside West, was published in 2010 by the University of Utah Press. He’s traveled widely and written about such places as the Na Pali coast, the Aysen region of Patagonia, and the coral reefs of Cuba. Jim’s short stories and essays have appeared in literary journals around the world, including Island, Frontieres, Divide, Sport Literate, Puckerbrush Review, Kinesis, Apostrophe, and Rolling Stock. He has read his work at the Sorbonne in Paris and was the featured American author at the Watermark Literary Muster in Australia. Jim has worked as an outdoor journalist, wildlife biologist, musician, and university professor. He currently lives in Eldora, Colorado. An award winning filmmaker whose public service projects have aired on PBS and major networks. He has produced documentaries on social issues, drug addiction, infant mortality. He has developed interactive learning applications in medicine, physics, chemistry, economics, statistics, and more. He brings realism, humor, and a touch of the absurd to the screen. Lisa is an Anthropologist. She considers anthropology a lens through which to view the world. She also likes to view the world through camera lenses. She has worked as an archaeologist, museum assistant curator, community worker and volunteer. She is a musician, associate producer, and involved with community radio. She is also a punk with a big heart who likes to hear people’s stories. Creator of Frozen Dead Guy Days, the festival, and managed the event for the first seven years. I now serve as the media coordinator for the festival and manage the Parade of Hearses. I manage two AIRBNBs in Nederland and serve as Executive Assistant to the President of First Tracks Consulting Service, LLC, a company involved in promoting clean tech industries and greater reliance on sustainable energy sources by major public utility companies. Owned Off Her Rocker Mercantile. Served as Chair of the Nederland Downtown Development Authority for seven years and President of Nederland Chamber of Commerce for 5 years prior.